Taking college level classes in Japan can be an unbelievably daunting task. You might be lucky enough to have a school that offers English language classes for your program, but sometimes you have to take at least one class taught in Japanese with other Japanese students. Even if you are at what we consider a high-intermediate or advanced level, there are still many challenges you have to face. One of the biggest ones is keeping up with Japanese academic language. The ability to hold a conversation with your peers, your host family, and even your Japanese language professors is not the same as being able to understand and subsequently hold a conversation or argument in a Japanese language only classroom. There are terms you just haven't been exposed to. Sometimes you won't even know the equivalent in your own language. So how are you supposed to prepare? Sources for these kinds of situations are almost always written in Japanese, and they are nearly impossible to parse through if you don't know where to start and haven't breached the topic you are diving into before. That's why Charles De Wolf's How to Sound Intelligent in Japanese is so exceptional. It allows you to learn new words, see how they are used, their etymology, and what field they are often used in. Sadly, this isn't for everyone. If you aren't extremely confident in your kanji knowledge or Japanese in general, you aren't going to be able to get much out of it. But if everything you've read so far fits where you are in your Japanese language journey, you'll want to read on. There is a lot of high-brow information packed into this one little book. While it may look small, it is surprisingly dense. It covers a number of broad academic topics, making it pretty easy to find your area of study and get what you can out of it. Mine, for example, are both Literature and Linguistics, which are in the chapter titled "The Fine Arts, Humanities, and Social Sciences." When I flip to that section I see what I'm looking for. 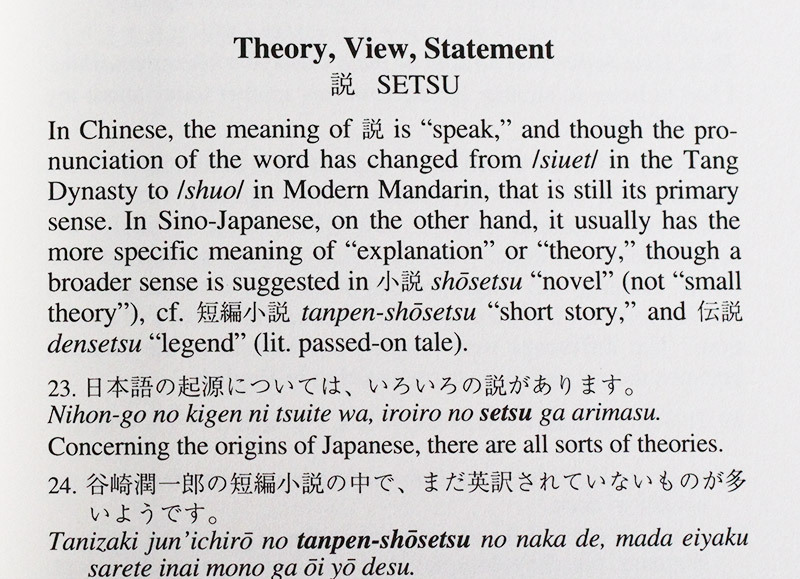 General literary terms, Japan-specific terms, and example sentences using these new terms that one would typically see or hear in an academic setting. 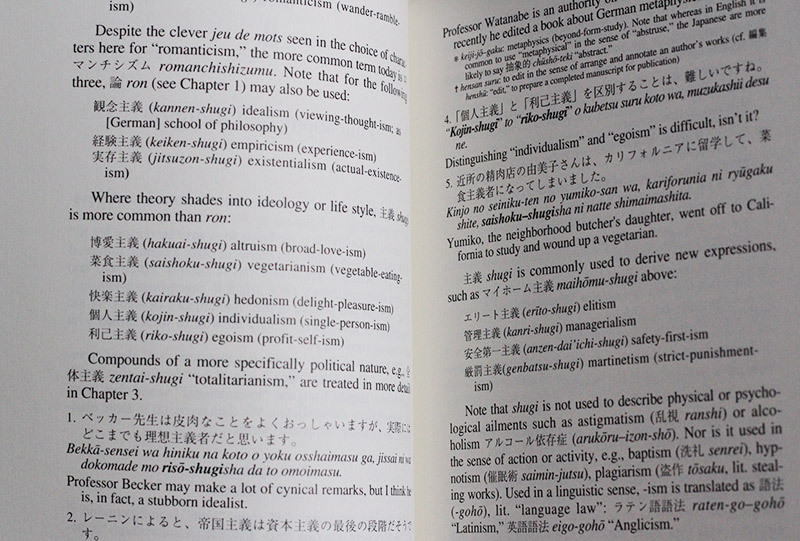 Then it goes onto Linguistic terms, with a section for Japan-specific terms once more, and then examples. This is the basic layout the entire book follows, with only a small bit of variation. 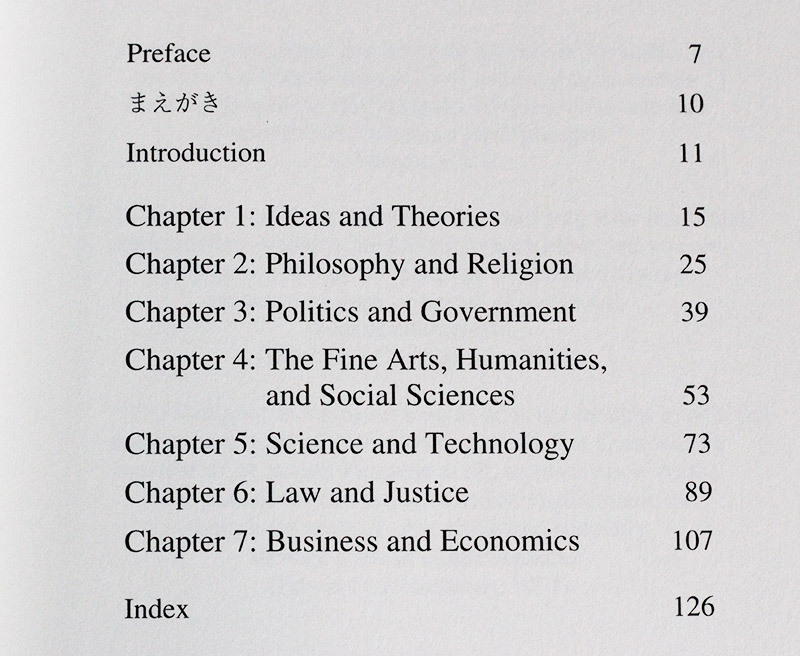 For example, the first chapter "Ideas and Theories" goes into the specific etymology of each term it is covering, the words that it makes up and their etymology, usage, and example sentences. For anyone studying a topic covered in the table of contents, there is almost definitely something you can pick up from reading through the chapter or section on your field. I can see this being helpful to grad students living or studying in Japan in particular. Learning how to form your argument and how to use the right terms for your specialization can be really really motivating. You wil improve your professor's opinion of you and your work, be able to understand the terms used around you in lectures, and, if you're brave, contribute using the same words yourself. This is in no way a grammar book. It is exactly what the subtitle "A Vocabulary Builder" suggests. It is not going to teach you grammar or kanji. It is not going to teach you the Japanese words it doesn't specifically focus on either. While it does offer romaji after each example sentence, as well as an English glossary, you need to be able to read the Japanese to understand what is being taught. You also need to have a very firm grasp on kanji, specifically on'yomi readings and meanings, not just the kun'yomi or meanings alone. This book is very specific in its goal. To improve upon what you already know. To go further, not back or to refresh what it thinks you should know. It is pretty unforgiving in that regard, brutal almost. If you buy this before you are ready, you will get a headache and probably put it away for years. You might even hate the way the author writes and give up. He uses what many people would call snooty, intelligent English just to make himself seem smart. If you feel that way, I hate to break it to you, but that's what "sounding intelligent" is usually considered to be. Don't worry, your Japanese will not sound like that. 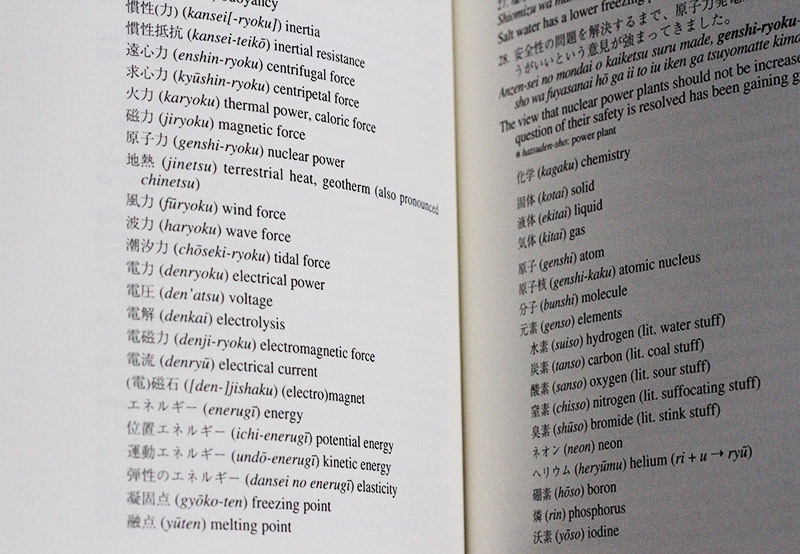 The terms you will learn will help you comprehend Japan's understanding of certain topics and how Japanese people study and think about them. Adding to your vocabulary will not make you sound stuck up. Just think of it as a way to impress stuck up people instead. My biggest suggestion is to wait until you think you really need this before you buy it. It has a lot of information. I guarantee you will not read the whole thing in one sitting unless you're some kind of word crunching robot. You may never read more than one or two chapters (the chapter on science went right over my head and I'll never read it again). This being the case, I really wish this book was longer somehow, or perhaps organized a little differently. You get a section dedicated to what you want to learn and it is a lot shoved into a few (or more) pages. The example sentences are really helpful, and honestly, they're great representations of what you'll hear academics say in Japanese, but I wish there were more. In the grand scheme of things, this book couldn't have held anymore, but maybe having one book cover so so much wasn't the best decision. To get examples of every new vocabulary word that is introduced, you will still need to do extra, outside research. This isn't so much a bad thing as it is inconvenient. If you do not have a specific field you are researching or trying to supplement, then you can slowly push through the entire book and learn quite a few fancy words. But just know that outside research needs to happen otherwise. 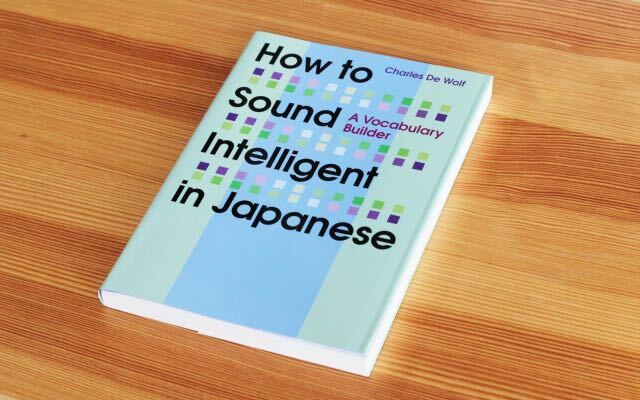 Or, if you are already an academic within the field of Japanese, you can use it to support and reinforce what you already know about your area of focus. In the end, while it may be very high-brow and academic in style, there comes a point for some learners where this is exactly what they are looking for. 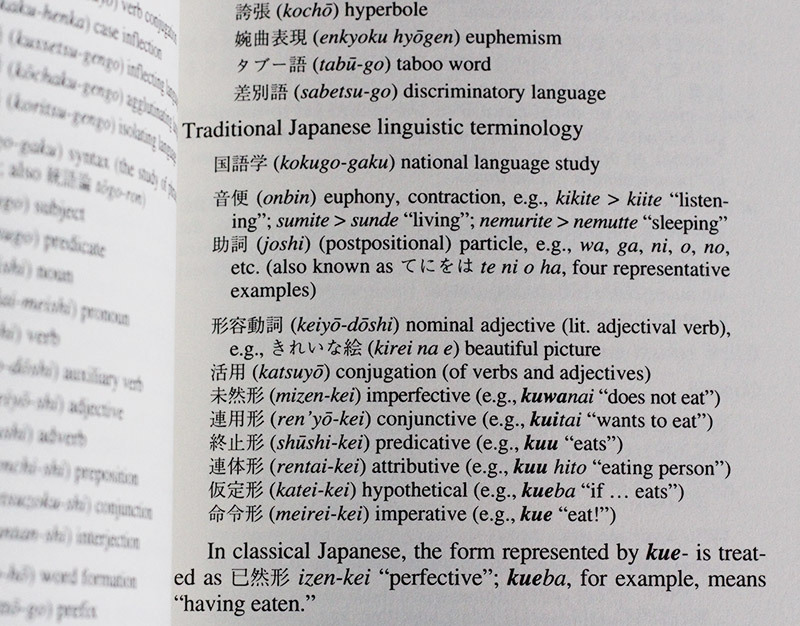 It is best used at the graduate level and for students taking classes in Japan, or perhaps even (future) professors who are looking to improve their academic vocabulary. 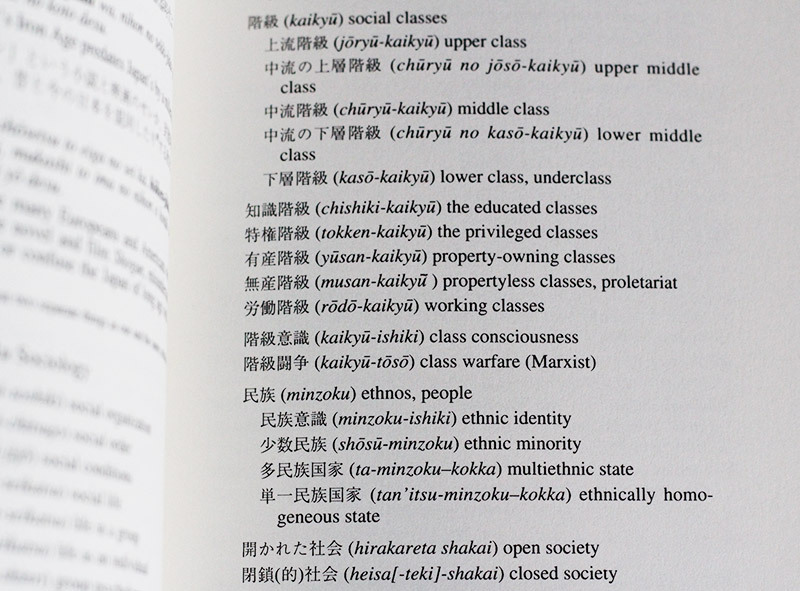 If you want to keep up in Japanese classes in Japan, classes like philosophy, linguistics, and political science, I can see this book being incredibly useful. If you want to be a member of the educational elite, able to keep up a conversation about -isms or science terminology, this might be exactly what you are looking for. Even if you are just reaching that advanced level and thinking there is nothing left to learn, this will spin you around and turn you on your head. It just proves there is always more to learn and improve upon. That is, if you're up for the challenge. While I found this book really useful, because I’m interested in literature and linguistics, I really only found myself going back to two of the seven chapters. If something you like is covered, then it’s great, but don’t expect to get something out of it if you aren’t really deep in one of those fields, or taking a class on one of these subjects.